The U.S. House of Representatives is expected to pass new legislation that would block the sale of American-made aircraft to Iran. The measure, which President Barack Obama has said he would veto, would bar the Secretary of the Treasury from authorizing a transaction by a U.S. financial institution related to the export, or re-export, of commercial aircraft to Iran. And it would revoke any authorities enacted before the bill passed, such as those that allowed the Boeing and Airbus sales. The Obama administration said in a statement on Nov. 14 that the legislation would interfere with the U.S.’s ability to uphold its end of the nuclear deal, which includes guarantees that Iran would be able to access the U.S. marketplace for commercial aircraft. 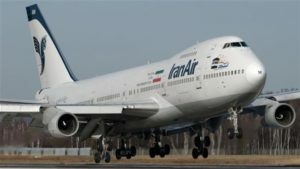 “The bill would undermine the ability of the United States to meet our JCPOA [Joint Comprehensive Plan of Action] commitments by effectively prohibiting the United States from licensing the sale of commercial passenger aircraft to Iran for exclusively civil end uses, as we committed to do in the JCPOA, and seeking to deter companies from pursuing permissible business with Iran,” the White House statement said. Trump has vowed to scrap the JCPOA. Rep. Peter Roskam, Illinois Republican, told the Washington Free Beacon that Republican House lawmakers will easily pass the legislation. Roskam told the Free Beacon last month that there was reason to expect Iran would use Boeing aircraft for military purposes.